It is also the first vehicle featuring the company's full Skyactiv Technology suite, including a rigid, lightweight platform, combined with a new series of efficient engines and transmissions resulting in reduced emissions and fuel consumption. The Skyactiv Engine and Transmission Technologies were first released in the 2012 Mazda3 compact sedan and hatchback. The design of the CX-5 was based on the Mazda Minagi. The Mazda CX-5 replaces both the Mazda Tribute and the Mazda CX-7. The CX-5 was first shown at the September 2011 Frankfurt Motor Show. The Japanese model was unveiled at the 2011 Tokyo Motor Show, along with a customized variant featuring a red exterior body color, with alloy wheels painted in matte-black and a slightly lower body height, which was unveiled in later 2012 at the Tokyo Motor Salon. Production models went on sale in 2012, with a choice of SKYACTIV-D 2.2 or SKYACTIV-G 2.0 engines, matched to SKYACTIV-DRIVE six-speed automatic transmissions. At its introduction in 2012, it won the Car of the Year Japan Award. The CX-5 is available with both front-wheel and all-wheel drive, powered by a 2.0 liter gasoline four-cylinder engine (PE-VPS) sporting 162 bhp (121 kW; 164 PS)/155 lb⋅ft (210 N⋅m) averaging an estimated 28 mpg‑imp (10 L/100 km; 23 mpg‑US) emitting around 139 g/km. It will also be available with a 2.2-liter two-stage turbocharged diesel (SH-VPTS) with either 147 bhp (110 kW; 149 PS)/280 lb⋅ft (380 N⋅m) or 173 bhp (129 kW; 175 PS)/310 lb⋅ft (420 N⋅m), emitting an estimated 119 and 139 g/km, respectively. Fuel consumption for the entry-level diesel engine with front-wheel drive is 63 mpg‑imp (4.5 L/100 km; 52 mpg‑US). According to IIHS (Insurance Institute for Highway Safety) the 2013 CX-5 achieved Good crash test ratings in Moderate Overlap Front, Side, Roof Strength, and Head Restraint & Seats categories, while achieving only a Moderate rating in the Small Overlap Front crash test. Design changes were subsequently made that brought up the Small Overlap Front rating up to a Good rating. The small overlap test, introduced in 2012 by the IIHS, simulates a frontal collision on 25 percent of the driver's side front corner. Since its adoption, the IIHS has noticed several automakers making non-symmetrical modifications to their vehicles to improve ratings. Another small overlap test was conducted on a number of vehicles, including a 2015 CX-5, but was conducted on the passenger side instead. The crash test showed substantially more intrusion into the passenger side than into the driver's side of the CX-5. Japan production of the Mazda CX-5 fitted with a SKYACTIV-D 2.2 diesel engine began at Ujina Plant near Mazda's headquarters in Hiroshima. In 2012, Mazda CX-5 production at Ujina Plant was set to increase to 240,000 units per year by expanding production from Ujina Plant No.2 to boost Ujina Plant No.1. The Japan domestic market CX-5 achieved monthly sales 8 times higher than forecast just after its launch in February 2012, with the "clean diesel" (as it is referred to in Japan) model accounting for 73% of the sales. The first generation Mazda CX-5 was launched in Malaysia in May 2012. At launch only one trim level was offered with the 2.0 L SKYACTIV-G engine paired with a 6-speed automatic transmission. Though, consumers had the choice between FWD or AWD and it was fully imported. In August 2012, the 19" wheels previously offered was replaced with 17" wheels. In June 2013, locally assembled models became available. The previously offered, fully imported trim was renamed to High Spec and a new lower trim level, Mid Spec was launched. The Mid Spec was only available with FWD while the High Spec continued to be offered with both FWD and AWD. In April 2015, a new base variant was launched dubbed GL. The first-generation facelift version was launched in Malaysia in May 2015. Initially, the facelift version was fully imported and only available with the 2.5 L engine. Though again, consumers could choose between FWD or AWD. The locally assembled facelift version was made available in early 2016 with either a 2.0 L SKYACTIV-G engine or a 2.5 L SKYACTIV-G engine. The 2.0 L engine could be had with only FWD but two trim levels: Mid Spec and High Spec with Mid Spec being the more affordable of the two trim levels. The 2.5 L engine was only available with one trim level but with either FWD or AWD. The In July 2016, a 2.2 L SKYACTIV-D powered, FWD, locally assembled variant was launched in Malaysia. It was positioned in between the 2.5 L SKYACTIV-G FWD and 2.5 L SKYACTIV-G AWD variant. The Australian production of the Mazda CX-5 was first introduced in 2012 and was available in Maxx, Maxx Sport, Grand Touring and Akera variants. The initial models were available in either a 2.0 gasoline engine or a diesel engine with front wheel drive and all wheel drive as options (only the 2.0 was available with FWD). Automatic was standard on all wheel drive models (manual was available on the 2.0 gasoline Maxx FWD). Early European models include choice of SKYACTIV-G 2.0 and SKYACTIV-D 2.2 engines. To promote the CX-5, Mazda teamed up with Universal Pictures for their strategic partnership in support for the launch of the movie, Dr. Seuss's The Lorax, and Mazda launched a co-branded national Dr. Seuss's The Lorax-themed commercial spot based around Mazda’s SKYACTIV TECHNOLOGY. The United States version of the CX-5 debuted at the November 2012 Los Angeles Auto Show. Initially, the only engine available was a direct-injected 2.0-liter four-cylinder Skyactiv-G gasoline engine with 155 bhp (116 kW; 157 PS), which is less than the 163 bhp (122 kW; 165 PS) first reported. However, it is rated at 26 mpg city and 32 mpg highway with automatic transmission and 26 mpg city and 35 mpg highway with manual transmission. For the model year of 2014, an available 2.5-liter four-cylinder Skyactiv gas engine was introduced to address the main criticism of the CX-5. It is rated at 184HP/ 185-lb.ft, with an EPA MPG rating of 25/32 (FWD), 24/30 (AWD). Only the six speed automatic transmission is available for this engine. This engine is standard on the Touring and Grand Touring trim levels. The 2.0 engine carries over in the base Sport model. Front-wheel drive and all-wheel drive are offered for all model grades. The 2013 Mazda CX-5 was one of the five finalists for the 2013 Green Car of the Year awarded by the Green Car Journal at the 2012 Los Angeles Auto Show. The facelift model Mazda CX-5 was unveiled at the 2014 Los Angeles Auto Show as a 2016 model. Notable changes include updates to exterior styling, reductions in road noise, an improved infotainment system and a sport mode for the six speed automatic transmission. The Technology package on Touring & Grand Touring Models also get LED headlights, LED fog lights and combination LED tail lights. The SKYACTIV-G 2.5 engine was made standard on all United States trim levels, except the base level Sport equipped with the six-speed manual transmission and front wheel drive, which retained the 2.0 liter powerplant. In the end of 2015, Mazda increased the level of standard equipment offered in the United States and Canada, christening the upgraded vehicles as 2016.5 models. In the United States, a backup camera and touch-screen audio system were made standard on the base Sport trim level with the automatic transmission, leaving the manual-transmission Sport as the only model to lack these features. The navigation system became standard on mid level Touring and top level Grand Touring trim levels, along with heated front seats on the Touring. List prices remained the same or increased, although the Touring and Grand Touring price increases were less than the premiums previously charged for the optional navigation system. In Canada, the mid-level GS and top-level GT received standard navigation systems, and the GT also received a power adjustable driver's seat with memory. The SKYACTIV-G 2.5 engine was made standard on the base-level GX with the automatic transmission; the GX with the manual transmission became the only trim level to retain the 2.0-liter engine, similar to the lineup in the United States. The second generation CX-5 was unveiled with an overhauled design and new tech on November 15, 2016 at the Los Angeles Auto Show. It features the first Mazda diesel ever sold in North America. The CX-5 is available with SKYACTIV-G 2.0 gasoline, SKYACTIV-G 2.5 gasoline and SKYACTIV-D 2.2 diesel engines. New features include a new 'Soul Red Crystal' body color as well as a new remote controlled powered tailgate. The 2019 CX-5 adds the CX-9 engine as an option. The Skyactiv-G 2.5-liter turbocharged four-cylinder produces 250 horsepower at 5,000 rpm on 93-octane fuel and 227 hp on 87-octane. Mazda claims the new engine delivers 22 mpg city, 27 highway, and 24 mpg combined in AWD trim regardless of octane. Mazda Singapore officially launched the second-generation CX-5 on July 21, 2017, offered in either 2.0L 2WD or 2.5L 2WD models. Variants include the 2.0L Standard Plus, 2.0L Premium, 2.5L Luxury and 2.5L Super Luxury. It received a facelift in February 2019. The second generation Mazda CX-5 was launched in October 2017. It was available in five variants: 2.0 gasoline 2WD GL, 2.0 gasoline 2WD GLS, 2.5 gasoline 2WD GLS, 2.2 Diesel 2WD GLS and 2.2 Diesel AWD GLS. Mazda Minagi Concept at 2011 Geneva Motor Show. Mazda MINAGI (マツダ 勢(MINAGI)) concept car is the first Mazda vehicle featuring Mazda's new 'KODO – Soul of Motion' design language and SKYACTIV technologies. ^ "CX-5". MAZDA. Retrieved 2011-11-06. ^ Vijayenthiran, Viknesh (15 December 2011). "Mazda CX-5 Platform To Spawn Next-Gen Mazda6 And Mazda3". MotorAuthority. High Gear Media. Retrieved 13 January 2014. ^ "Skyactiv Technology". MAZDA. Retrieved 2011-09-05. ^ "Mazda CX-5 Production Line 2011". Mazda Group Video. Retrieved 2012-02-29. ^ "Mazda Group – Production Sites in Japan". mazda.com. Archived from the original on 2010-12-29. Retrieved 2012-02-29. ^ "2013 Mazda CX-5: production with SKYACTIV diesel engine begins". auto123.com. Retrieved 2012-01-27. ^ "Both Mazda CX-5 and CX-7 Will Be Built in China". ^ "Mazda Joined Ranks of Cars Assembled in Russia". ^ a b c d e "Mazda to Launch All-New Mazda CX-5 Crossover SUV". mazda.com. Retrieved 2012-02-29. ^ "Road test: 2014 Mazda CX-5 GT By Nick Tragianis". Postmedia News. 2011-10-20. Retrieved May 23, 2013. ^ "MAZDA:Mazda Announces New Compact SUV Will be Mazda CX-5 - News Releases". mazda.com. ^ "MAZDA:Mazda TAKERI to Bow at 2011 Tokyo Motor Show - News Releases". mazda.com. ^ "MAZDA:Mazda to Display Mazda CX-5 at Tokyo Auto Salon 2012 - News Releases". mazda.com. ^ "MAZDA:Mazda to Launch All-New Mazda CX-5 Crossover SUV - News Releases". mazda.com. ^ "Mazda Press Release: CX-5 Wins Car of the Year Japan". Mazda. ^ "Vehicles with good driver-side protection may leave passengers at risk". Insurance Institute for Highway Safety. ^ "MAZDA:Mazda Commences Production of Mazda CX-5 with New-Generation Super Clean SKYACTIV-D Diesel Engine - News Releases". mazda.com. ^ "MAZDA:Mazda to Increase Mazda CX-5 Production Capacity - News Releases". mazda.com. ^ Integrity Exports (2012-04-11). "Mazda CX-5 "Clean Diesel" Reverses Diesel's Decline in Japan By Stephen Munday". IntegrityExports.com. ^ "Mazda CX-5 launched - 2.0 SkyActiv-G, RM155k to RM165k". Paul Tan's Automotive News. 2012-05-16. Retrieved 2018-08-12. ^ "Mazda CX-5 wheels downsized to 17 from 19-inches". Paul Tan's Automotive News. 2012-08-14. Retrieved 2018-08-12. ^ Kon (2013-06-04). "Mazda CX-5 CKD officially available in Malaysia - Autoworld.com.my". Autoworld.com.my. Retrieved 2018-08-12. ^ "Mazda CX-5 GL launched, new base variant at RM126k". Paul Tan's Automotive News. 2015-04-08. Retrieved 2018-08-12. ^ "Mazda CX-5 facelift in Malaysia: CBU 2.5, from RM168k". Paul Tan's Automotive News. 2015-05-07. Retrieved 2018-08-12. ^ "Mazda CX-5 facelift CKD previewed – 2.0 and 2.5 litre, 19-inch wheels on 2.5, identical prices expected". Paul Tan's Automotive News. 2016-02-03. Retrieved 2018-08-12. ^ "Mazda CX-5 2.2L SkyActiv-D diesel launched – RM162k". Paul Tan's Automotive News. 2016-07-20. Retrieved 2018-08-12. ^ "Review: Mazda KE CX-5 Review". australiancar.reviews. Retrieved 24 October 2017. ^ "2013 Mazda CX-5 Specs Released: 155 HP, Up to 33 MPG Highway, No Manual/AWD Combo". ^ "2013 Mazda CX-5 First Drive Review". Blog.caranddriver.com. 2011-11-16. Retrieved 2012-06-30. ^ Sebastian Blanco (2012-11-29). "Ford Fusion wins 2013 Green Car Of The Year". Autoblog. Retrieved 2012-11-29. ^ "2016 Mazda CX-5 Photos and Info – News – Car and Driver". caranddriver.com. ^ Meiners, Jens (November 2014). "2016 Mazda CX-5: Dressing Up Its Inner Space". blog.caranddriver.com. Car & Driver. Retrieved 2017-04-11. ^ Stoklosa, Alexander (2015-12-18). "Halftime Update: 2016.5 Mazda CX-5 Gets More Standard Content, New Pricing". blog.caranddriver.com. Car & Driver. Retrieved 2017-04-11. ^ "2016.5 Mazda CX-5 Brochure EN" (PDF). www.mazda.ca. Mazda Canada. Retrieved 2017-04-11. 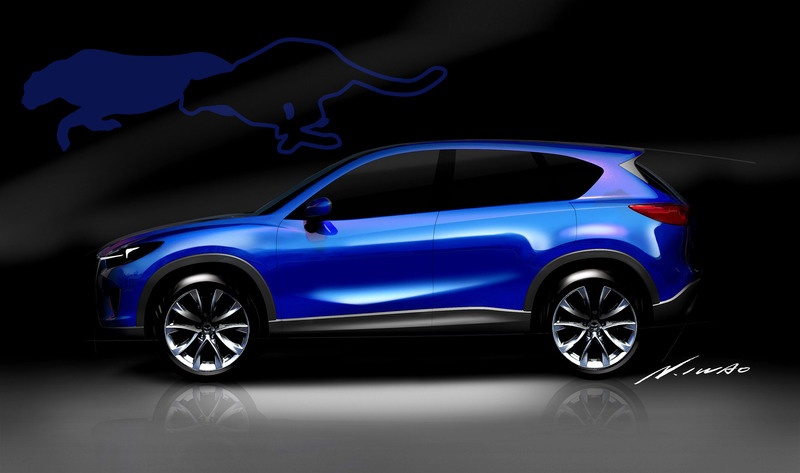 ^ a b "Mazda to Produce All-New CX-5 at Hofu Plant". Mazda. 15 March 2017. Retrieved 16 January 2018. ^ "Mazda Strengthens Production System in Malaysia". www2.mazda.com. 28 September 2017. Archived from the original on 30 September 2017. Retrieved 30 September 2017. ^ "Mazda CX-5" (PDF). euroncap.com. Retrieved 6 August 2017. ^ Goreham, John. "Déjà vu - Mazda Announces CX-5 Diesel For North America In 2017 - Torque News". TorqueNews.com. Hareyan Publishing. Retrieved 20 November 2016. ^ "New Mazda CX-5 Cars for Sale | New CX-5 Cars - Brayley Mazda". www.brayleys.co.uk. Retrieved 2016-12-01. ^ "All New Mazda CX-5 Launched in Malaysia – Drive Safe and Fast". www.dsf.my. Retrieved 2018-01-30. ^ "2017 Mazda CX-5 launched in Malaysia - five CKD petrol and diesel variants offered, from RM134k". Paul Tan's Automotive News. 2017-10-11. Retrieved 2018-01-30. ^ "All-New 2017 Mazda CX-5 CKD Launched In Malaysia – Petrol, Diesel, 155 – 185hp, RM134k – RM175k - Auto News - Carlist.my". www.carlist.my. Retrieved 2018-01-30. ^ "Buyers guide: Mazda KF CX-5 (2017-)". Australian Car Reviews. ^ "MAZDA REPORTS CALENDAR-YEAR 2013 SALES - Jan 3, 2014". mazdausamedia.com. ^ "MAZDA REPORTS BEST ANNUAL SALES IN 20 YEARS - Jan 5, 2015". mazdausamedia.com. ^ "Mazda CX-5 Sales Figures - GOOD CAR BAD CAR". www.goodcarbadcar.net. Retrieved 2016-04-10. ^ "Mazda Reports December 2017 and Full-Year 2017 Sales | Inside Mazda". Inside Mazda. Retrieved 2018-03-13. ^ Jeremy Korzeniewski (1 March 2011). "Geneva 2011: Handsome Mazda Minagi Concept previews production crossover". Autoblog. ^ "MAZDA:Mazda MINAGI Concept to Showcase Mazda's All-new SKYACTIV Technologies and KODO Design at the Geneva Motor Show - News Releases". mazda.com. Wikimedia Commons has media related to Mazda CX-5.